Seated in my negotiations class, explaining the interests of “my client,” and trying to get my head around those of my opponent’s in a role-play scenario we have been assigned, it is refreshing to practise a skill in law school that is relevant to the practice of law. I feel my toe tapping, signaling my interest at the ensuing back and forth. As I keep one eye on the elements of the negotiation and another on the process, I imagine myself one day applying these skills on behalf of a client. It is bound to happen given the prevalence of negotiating in the legal sphere. The Department of Justice reports that a staggering 98 per cent of civil suit cases do not proceed beyond pleadings given out-of-court settlements. As a result, “litigotiation” is on the rise.Coined by Professor Marc Galanter, the term denotes the “strategic pursuit of a settlement through mobilizing the court process.” And the Federation of Law Societies of Canada has listed “Negotiating in a manner appropriate to the legal and factual context” as a requirement for admission applicants. There are 15 students in the elective course offered once a semester. Simple math shows most University of New Brunswick law school graduates will leave without an introduction to negotiations. Questions arise. Is this a shortcoming of the Canadian legal curriculum? Are law schools best suited to teach negotiations or is the skill more appropriately mastered on the job? When it comes to negotiations, are law students getting a bad deal? William Ury, the godfather of principled negotiations and co-author of Getting to Yes With Yourself, is clear on the need to make negotiations a required element of a modern legal education. “In my view, negotiations ought to be a core requirement because it’s the key skill that lawyers deploy because the overwhelming number of cases are settled through negotiations,” he tells me in a phone interview. As a co-founder of the program on negotiations at Harvard Law School, Ury gained insights on university decision-making. But John Williamson, UNB’s dean of law, sees the decision to heave another mandatory course at law students as more complicated. “Beyond our core curriculum, we are trying to offer what best we can with our resources and give students the opportunity to choose courses that will provide substantive knowledge and skills for different career paths including but not limited to practice,” he says. Furthermore, resources are finite. “If you offer this one, you’re not going to offer that one,” he says of his budgetary restrictions. And advocates for negotiations aren’t the only ones lobbying law deans. Given mounting public interest in and support for the unique experience of aboriginal populations in Canada, aboriginal law has begun appearing on the required course list at some schools. In 2012, the University of British Columbia Allard School of Law incorporated a mandatory first-year aboriginal law course. On the other hand, the University of Calgary has recognized the widespread need for negotiations training among its graduates. The “Calgary curriculum” is more “rigorous” and “relevant” and includes more performance-based learning than the common course requirements. This current academic year marks the first of its rollout. Completion of a negotiations course is now mandatory to graduate from Calgary. However, the school is still allowing students to customize their legal education by offering the subject through the lens of different substantive areas such as contract, tort, or criminal law. Calgary says it is adopting a problem-based learning platform suited to subjects such as negotiations. The approach is not uncommon in negotiations. Many schools use experts in the field to ensure students are getting cutting-edge insights. “I think my main contribution is my practical experience,” says Natasha Carew, a negotiations team teacher at Osgoode Hall Law School, of the benefit she brings to the class. Carew is an associate at Gowling WLG who specializes in construction law and mediation. Osgoode teaches negotiations through a main professor and teaching team of five to six practitioners. Students receive a combination of both theory and practical experience through this teaching structure mashup. As a signal of the format’s success, Carew sees dramatic improvements among students. This, she says, is a stark contrast to the final negotiation. How harmoniously this new broad-based approach that Calgary is applying will operate alongside the university’s traditional delivery and measure of education through lectures and testing is yet to be seen. Students and employers will monitor with great interest. The odd-couple pairing — theory and practical — may give rise to nudges that negotiations skill development is better suited to the firm than the classroom. But this is not possible, according to academics Daniel Bradlow and Jay Finkelstein of the American University Washington College of Law. The pair observes that when negotiations training is postponed until a graduate’s law firm start, time and resources likely will not permit a comprehensive journey up the steep learning curve. The leading lawyer on a transaction, either a partner or senior associate, is likely to be too busy or ill-equipped to provide this sort of necessary training, so learning on the fly by osmosis is more probable. Ury adds to the criticism of postponing negotiations training until a graduate is employed. “In battles of war, which has some similarities to a trial, it would be ludicrous to expect a commander to leave the battlefield to negotiate with the opposing commander before the battle is concluded,” she writes. Bratcher notes the tall order of asking a lawyer invested in trial preparation and trained in the intricate rules of court to depart the courthouse at the 11th hour and shift gears to negotiate a settlement. She argues that the talents required of a trial lawyer clash with those of a negotiator, particularly in the run-up towards and during a trial — a common period for settlement negotiation. “We need more peaceful conflict resolution in this world. But are the warriors the best choice for peace-makers?” she posits. The Federation of Law Societies Canada has added to the problem or solution, depending on one’s viewpoint, by including “Negotiating in a manner appropriate to the legal and factual context” as a proposed requirement for admission applicants. It would be hard for students to demonstrate something they’ve neither learned nor practised. However, FLSC president Jeff Hirsch says students have choices beyond academia to learn the methods. The bridge however between preparation for bar call and accreditation is a key federation priority. Hirsch is impressed with “practice-focused programming at law schools,” which help to prepare students to on-the-job success. And this fall, Hirsch says the federation’s annual conference, attended by law society and law school leaders, will focus on legal education to continue to facilitate dialogue and pursue solutions. Meanwhile, the present disconnect between what law students learn and what practitioners do is often glaring in practice for certified negotiations coach and family lawyer Lisa Eisen. “I commonly see people taking unreasonable positions,” she says. Eisen recalls a recent incident typifying this skills gap while resolving a marriage separation. “I had a lawyer on other side and he said, ‘OK, she is looking for this amount of money.’” Eisen suspected that the number “came out of a hat” so she probed deeper about the figure’s origin. Repeated back and forths did not elicit an answer. Eisen says incidents like this are common and ultimately end up both frustrating and costing clients. She says mandatory negotiations training in law school would sow rewards. 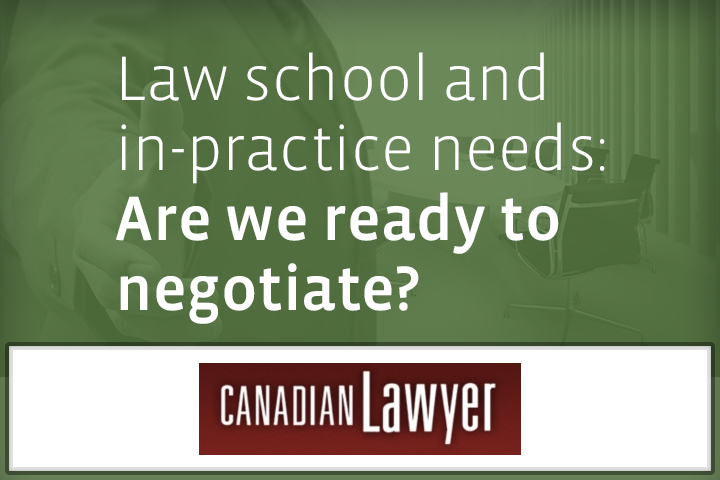 No Replies to "Law school and in-practice needs: Are we ready to negotiate?"